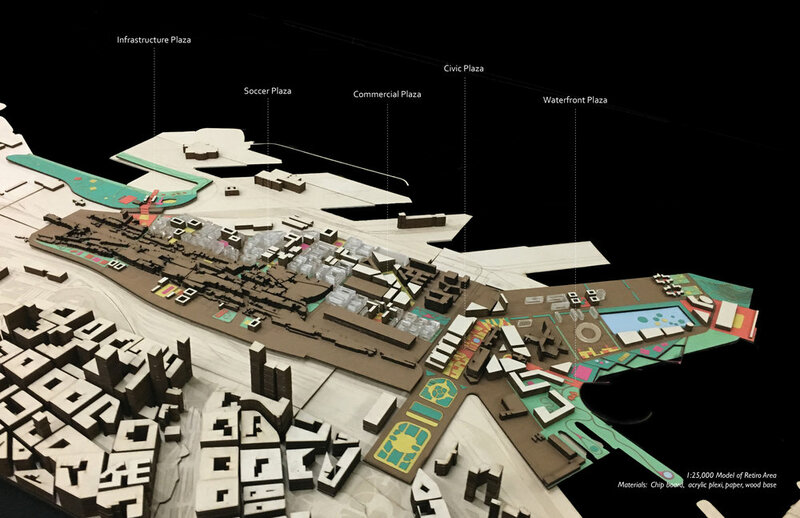 A 1:25,000 scale model of our "Plaza Acupuncture" concept for The Retiro area of Buenos Aires. Materials: Chip board, acrylic plexi, paper, wood base. 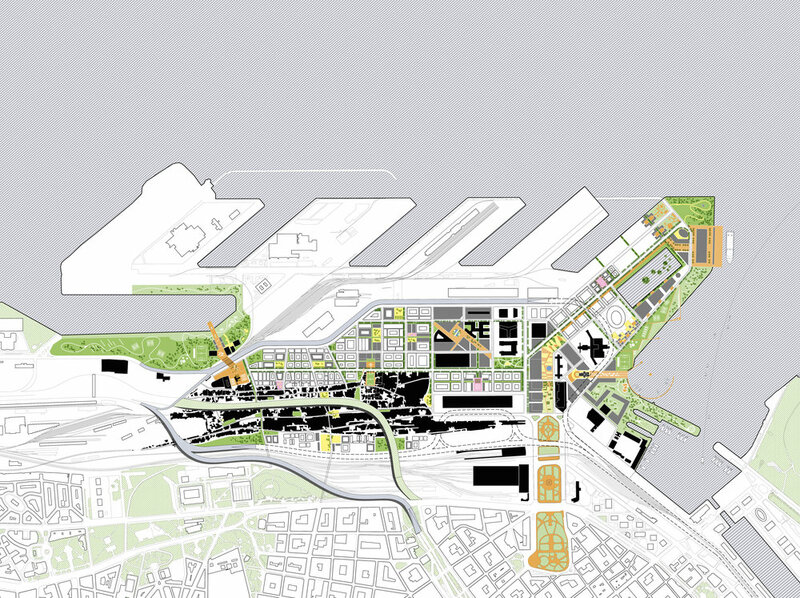 Working with the City of Buenos Aires, this urban planning and design studio at Harvard GSD was tasked with formulating strategies for resolving the infrastructural complexity of relocating part of the city’s port, integrating an informal settlement (Villa Miserias) with the formal city, and reconnecting the city to its waterfront, given that residents of Buenos Aires call themselves Portenos (people of the port) but no longer interact with the waterfront in their daily lives. Learning from the vocabulary of the formal city, this plan uses the concept of “plaza acupuncture” to re-invigorate the site with 5 discrete projects chosen to weave existing buildings into coherent urban spaces and create new neighborhoods around those plazas. 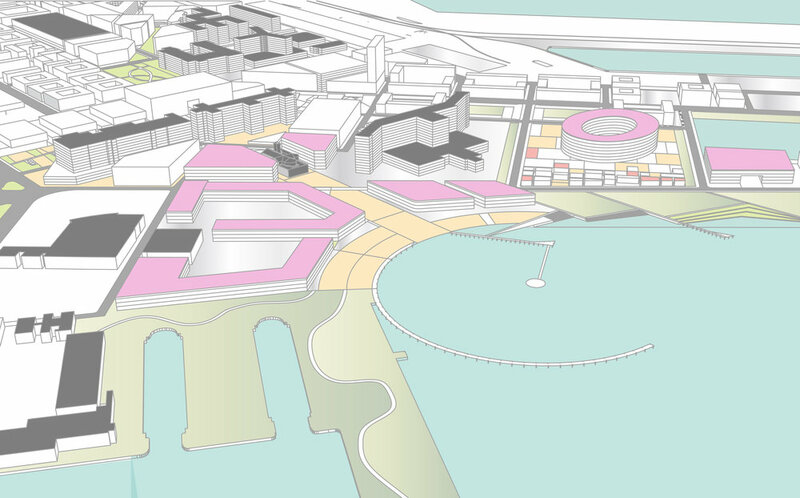 Massing of proposed infill development and waterfront plaza, with existing buildings (grey) in between. The waterfront plaza brings the City of Buenos Aires back to the water. This is accomplished by creating strategic open space insertions and new infill buildings in what is currently an amorphous and empty area. By creatively appropriating a small church that is currently inaccessible and situated behind gates to offices of the Argentinian Navy, the plaza makes use of existing buildings to create a new public space inspired bysome of the best public spaces in Buenos Aires. The naval church, currently isolated and closed to the public, becomes transformed into the centerpiece of a new waterfront plaza. This area of the Retiro is currently occupied by the Ministry of Justice and an old building for the National Postal Service. These buildings are inaccessible to the public and imposing. 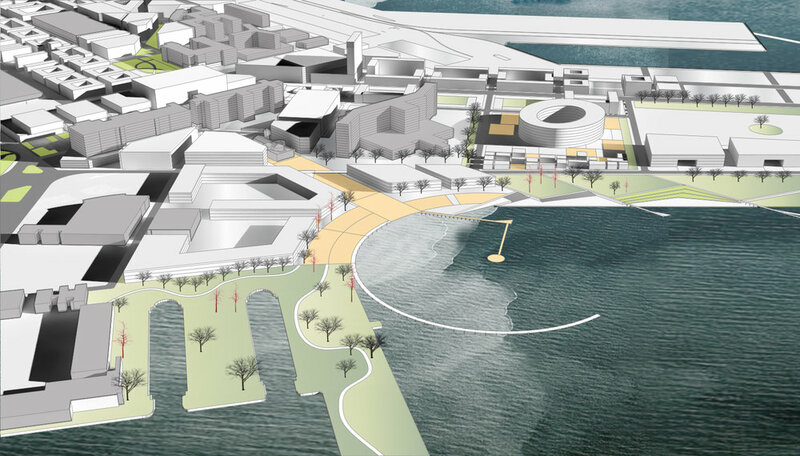 The plan keeps the institutional focus, but brings the public back into the area by creating a “civic plaza” with government offices, ground-floor retail, and a public library. The public library features an underground arcade that connects the plaza to the rest of the site. We identified the major problems with the Retiro site as: excessive devotion to infrastructural space, large plots of land held by government landowners, and a glut of open but inaccessible space that is closed to Porteños even though they claim the port as a key part of their identity. Our strategies responded to this lack of access and clarity by looking for opportunities to define different areas of the site based on programmatic themes present from the existing buildings, but then use strategic infill development to further define public spaces where people can interact with the water, the government ministries, and new commercial spaces. The Retiro site is institutionally complex. There are many different government ministries, the Port, the Air Force, and Navy, and private container terminal operators all owning land or use rights within the site. Additionally, the informal settlement occupied by residents presents an additional layer of complexity to implementing any plan. This is why we divided our project into five pilot projects: each project could be undertaken independently, without damaging the feasibility of any of the other ones. Each pilot project will have fewer responsible stakeholders, making the negotiation process less complex. In this way, the city could begin the project by choosing one of the sites as a pilot, and could pursue the additional projects as financial resources allow.